The Bellingham Blitz continued their winning streak with a victory over the Snohomish County Thunder, Saturday May 21 at Civic Field. The Thunder were out maned and out gunned from the kickoff. 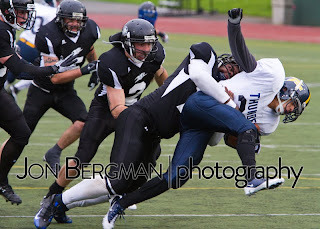 The Blitz's relentlessly hounding defense and punishing offensive ground attack sealed the Thunder's fate. Final score: 46-6. Click here to view photos of the game.